How I Write by Tim Akers | STEAMED! Our giveaways for a bag of swag from RT, and The Vampire Dimitri are wrapping up, have you entered yet? 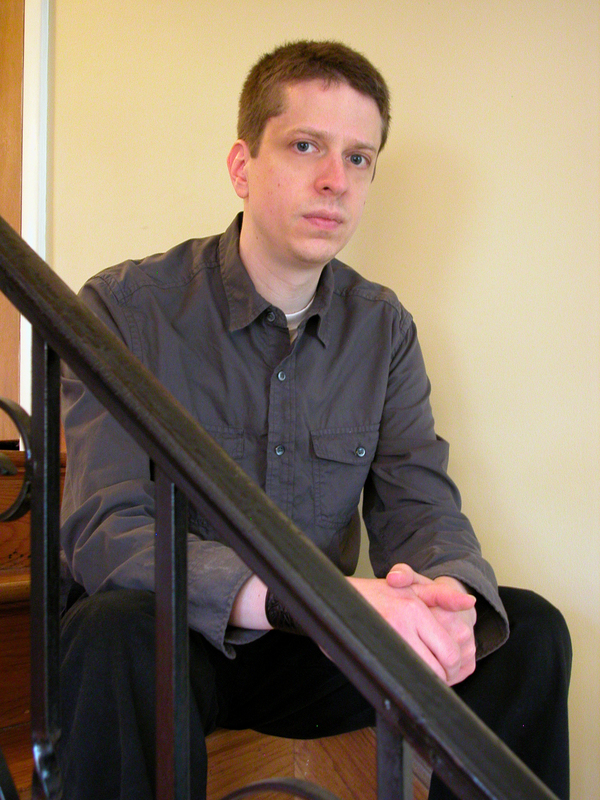 Today we welcome our last Pyr author, Tim Akers. The Horns of Ruin is out now. We have three copies to give away. Tim Akers was born in deeply rural North Carolina, the only son of a theologian. He moved to Chicago for college, where he lives with his wife of thirteen years and their German shepherd. He splits his time between databases and fountain pens. You can visit Tim’s Web site at shadoth.blogspot.com. In his recent interview with Locus, Daniel Abraham talked briefly about the two kinds of writers. He did this by contrasting his style of writing with that of George Martin. George, he said, is a gardener. He likes to get into the world and nourish it and watch it grow. In contrast, Daniel describes himself as an architect. Outlines, word count fetishes, strict narrative discipline. This got me to thinking about how I write, and how my style of writing impacts what I write. I’m an incredibly self-analytical writer. I stopped using beta readers while writing my first novel, at least partially due to time constraints and the general chaos that is my daily life, so I’ve had to develop a very keen sense of what I’m doing and whether it’s working. That said, I had never really thought about it in the sort of terms Daniel was talking about, so I took a step back and thought about what I was doing, and why. I came to the conclusion that I’m not a gardener or an architect. I’m sort of an architectural gardener. How’s that for a cop out? Seriously, I form very sketchy outlines of what I want to do, then I go through and develop a number of anchor points for the narrative. These are generally points of confrontation or revelation that help define the narrative, or the characters. I develop those anchor points in my mind, usually sketching out who will be there, why they’re in place, what motivations they bring to the scene, what they hope to get out of the encounter, what I as the writer hope to get out of the scene, and finally what the reader will hopefully get out of it. I might write snippets of the scene, but usually I just ghost together an outline in my head. Then I work toward that point, and from that point to the next anchor point, and eventually I have a narrative. Sounds very architectural, yeah? The gardening comes in with the characters, and with certain elements of the plot. I’ll admit to being one hell of a geek. I learned most of my storytelling skills by running tabletop roleplaying games. When I was doing that, I didn’t follow hard and fast narrative structures for my games. I never created a problem and then created a solution to the problem. That was the players’ job. In fact, I rarely created specific problems. My goal was to create a cast of non-player characters with their own ambitions and machinations, wrap them in an environment that’s conducive to conflict, and then introduce the players into that environment. Things always happen. Based on the character’s backgrounds and ambitions, I would maybe drop a hook or develop some kind of integration into the NPCs business, but mostly I waited for the players to bump into trouble. Then I would make the trouble worse, and let the players work their way out of it. I did a lot of improvising, never really sure how this development or that clue was going to work out for the overall story, but always sure that it was making things more complicated for the game. And complicated is good. In novels I have to dial this sort of thing back, but only a little. It’s good to keep your eyes on those anchor points, but don’t be afraid of making chaos on the way there. Garden, but garden with a structure in mind. Play with the environment, but remember that part of gardening is pruning. In the same way, part of architecture is the joy of the unexpected discovery, the unplanned development. There must be serendipity, and there must be form. What kind of writer (or reader) are you? 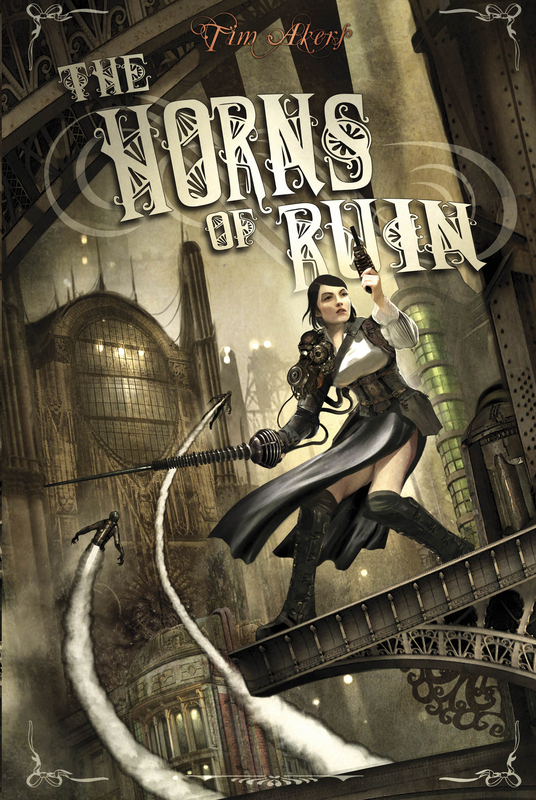 We have three copies of The Horns of Ruin to give away to three lucky posters. Open internationally. Ends April 22, 2011 at 11:59 PM PST. on April 15, 2011 at 5:12 am Giada M.
I am an omnivorous reader, even if, like everyone, I have my preferences. (Right now steampunk and fantasy) However my preferences are not static. I am a reader who loves to change and tends to jump from one genre to another. I’m the kid who used to read the cereal box if there was nothing else handy. However, I want what I read to be entertaining – and not too heavy. I want escape from my work life so fantasy and sci-fi are high on my list. Steampunk is a new discovery to me and I love it! i like the sketch method of writing too. keeps me flexible and open to whatever may come. as for reading, i read an eclectic bunch -again to gain ideas and insight from variety. Anything fantasy –that isn’t here and now. Steampunk, scifi, urban, paranormal. I’ll read it all. I just got done reading a book that had so many twists it was a little over the top. Then half way through the book the POV changed, revealing even more twists. It kept me turning the pages, but it did get to be a little much after awhile. I’m more of an architect than a gardener. I struggle if I don’t know where I’m going, but I still enjoy a little bit of surprise;). on April 16, 2011 at 5:26 pm Noah B.
I like to think of myself as a spontaneous architect. I like to plan things out, which usually ends up in the form of a list of key events and a timeline for where they’ll come into play. These are my ‘bricks’- the pieces of the story that help build the entire ‘house,’ but oftentimes I end up with a whole pile of random bricks that have no placement. Those I save for a time when I have an empty hole I need to fill. The vast majority of what I read falls somewhere under the speculative fiction umbrella, but I range pretty widely therein, from epic fantasy through alternate history to hard SF. What a wonderful post! I had never heard of this way of describing writing styles but will bring it to my writing group’s attention. I’m the only writer in the group who does not do role playing and I noticed how much those who do have rich outer worlds and highly detailed characters – I envied them, these younger writers who came by it so easily, but when I realized they had already done their homework verbally, I learned to admire as opposed to envy their style. I now realize from you post how I am more of the gardener variety and I like it that way – it works for me. I’ve tried to combine the architect and gardener approach but still can’t quite pull it off, just bits and pieces there. Thank you for such a valuable post. Often writers can’t understand how other writer’s techniques and methods can be so different. This helps it all make sense. Contest Closed! Thanks for entering.